You must have all heard of the Latte Factor®. It was coined by author David Bach. It says if you save $4 a day by skipping a [Starbucks?] latte, and you invest it, you will have a lot of money when you retire. This inspired automatic savings programs such as Bank of America’s Keep the Change®. It rounds up your purchases on your Bank of America debit card to the whole dollar and then it puts the difference into a Bank of America savings account. Cynics say it’s just a way to encourage you to use the Bank of America debit card and savings account. Using the debit card earns Bank of America a swipe fee from the merchant. Bank of America’s savings account pays nearly nothing. A more recent variation is the Acorns mobile app. It watches your debit card and credit card transactions and it calculates your virtual spare change. Whenever you accumulate $5 worth of virtual spare change, it moves $5 from your bank account and invests it in a handful of ETFs. I don’t think these gimmicks really achieve much. Teaching kids, maybe. Adults for real, no. Just for kicks I looked at the transactions on our debit cards and credit cards in the most recent month. If we had used the Acorns app, it would’ve moved $20 from our bank account into ETFs. The $1 per month fee from the Acorns app would serve as a 5% load right there. Forget about the fee for the moment — let’s say they make it zero — does investing $20 a month really help? If we wanted to invest $20 a month, can’t we just schedule it ourselves directly with a mutual fund company without tying it to a mobile app and how many transactions we make on debit cards and credit cards? I think these roundup programs have the opposite effect of what they purport to achieve. People feel guilty of not saving or investing. The roundup program lets them check it off the list easily. “Look at how good I am. I invested $20 this month into 6 ETFs. I’m diversified.” Sure, everything has to start somewhere, but let’s not kid ourselves how much investing $20 a month will really do. I like the opposite, the reverse latte factor, if you will. Save money on large items but reward yourself with small luxuries every day. I did it recently with latte, or to be exact, coffee beans for making latte. Peet’s Coffee is a popular brand here in California. It was a sister company of Starbucks before now Starbucks CEO Howard Schultz bought out Starbucks and made it the Starbucks as we know it today. In addition to selling coffee drinks, Peet’s also sells freshly roasted beans in bulk. You can buy as little as half a pound. Coffee beans bought from grocery stores were roasted 30-60 days ago. Beans you buy from a Peet’s Coffee store (or peets.com) were roasted yesterday or within a week. Possibly due to placebo effect, I like latte made with freshly roasted beans better. The added cost over beans bought from the grocery store? About 4 cents per cup. I didn’t bother with double-blind tests. Whether freshly roasted beans are truly better or not, spending the small extra amount of money lets me enjoy a small luxury every day. It’s a very cost-effective reward. Is this the feared lifestyle inflation? It is, and it’s good and intentional. People say money is better spent on experience, right? Sipping latte made with freshly roasted beans every day is an experience. I believe financial success is not achieved by nickeling and diming. Don’t waste your precious willpower on trying to save a small amount each and every day. You will wear yourself out. Save the energy on things you do once but benefit forever, such as kicking up the 401k contribution to the maximum or moving your investments from a high-cost place to a low-cost place. Then you can make latte with freshly roasted beans all year long. Do you agree or disagree? Do you think frugality on every little thing day in and day out is actually the key to financial success? It doesn’t matter how much you spend on any single item. The key to financial success is to spend less than you make, and keep doing that year after year. I love this article…..and I think you nailed it Harry. I tried Acrons last year for 3 months….decided it was not worth it since they don’t actually deposit the “spare change”, they just track it, then make a pull from your linked checking account once your spare change hits $5. It felt more like just making a direct deposit push into a savings/investment account. I was also concerned about the fees. I stopped using it in Jan of this year and decided to use that extra ~20/ month to offset a 1% Roth 401k contribution. After reading this article, I think I did the right thing…$20 extra into a roth 401k vs into a taxable account is much better! It was fun to test it out though….. Though it is a very small and peripheral (virtually negigible) component of my portfolio, every time I buy a latte or ice cream, I add $5 to my Acorns account, in addition to rounding up my credit card transactions. Wouldn’t seeing your Acorns balance going up encourage you to buy more lattes and ice creams? Or is it more like buying carbon offsets? I definitely think you’re right that it’s good to prioritize your focus on the big decisions like saving enough, not paying too much in fees, and not buying too much car or too much house. A key learning from the book I linked to at the end is that willpower is a limited resource. You can’t afford to be penny-wise and pound-wise. Something is going to slip. You’d rather let the pennies slip. Yes, small things add up per the latte effect, but as you say large things add up even faster. Couldn’t agree more with you on this one! I work with middle class people all the time. We discuss how to budget, save, and think of their future. We also talk about trade-offs and what to sacrifice. I constantly remind people that it is ok to enjoy life now on the small things. If there are things that you like on a day to day basis, don’t necessarily give them all up. Sure they can add up, but you will not have to work an extra three years by indulging. Being a smart consumer is, well, smart. It is a very good idea to protect your money and the amount you are able to save. But I am not sure that saving on the little things you enjoy is really worth it. Well said! As a frugal person myself, I completely agree with you that penny pinching will do little to your finance. It is worthwhile to relax and spend a little money to treat yourself well. I think this also has a lot to do with the population you are talking to. A lot of my middle class peers tend toward spending money on a lot of “quality” stuff. For them these things add up. And then there is a demographic to them $4 latte is actually a lot of money. This could add up to a nice chunk of money otherwise they wouldn’t have if they spend them. 1) I used to say 15 minutes or $5 and below , is not an issue, to waste any thinking on, however, i’m tending towards now value for whatever it is, and ‘what is your time worth’ and simplicity. The more years go by, it seems inevitably more complication must be managed, mentally if not physically, so even dealing with the dumb acorn app, is a time killer, and is anti-simplicity for its “value”. 2) personally, it seems the right price for a cup of coffee , even good coffee, is something closer to $1 or less, never mind the overhead for the starbucks, if one is going to not sit at starbucks and use their google wifi and a/c for a hour. so, it’s a poor value to spend $5 on it, a “waste” imho. Willpower may be a limited resource, but most people could have far more than they do. Once bad habits are truly broken, or good habits truly engrained, they really don’t take much willpower to sustain. That said, it makes obvious sense to apply your finite time and willpower where it will benefit you the most. Of course, you should not focus on “little” things. But most people don’t really know what actually is “little” in their life. The latte is a decent example. 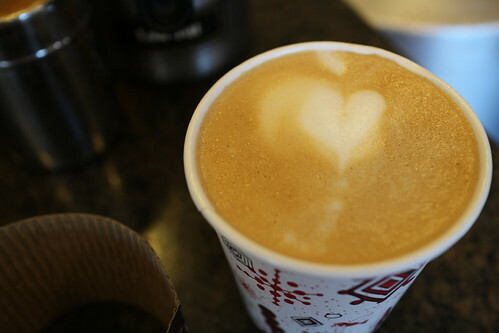 If you buy a $5 latte every day for a year, that is close to $2,000 per year. Since that outlay is also after tax, most people would have to earn at least $2,500 pre-tax to cover that. For an average worker in the US grossing around $50,000, that means 5% of their income goes to just pay for those lattes. Could you focus on “bigger” items (mortgages, bank fees, investments, etc.) and save more than $2,500 annually reducing them and still enjoy your lattes? Possibly, but maybe not. Depends on the person. If you love your lattes and can afford them, by all means go ahead. But $2,500 per year compounded over a lifetime of work is a good chunk of money for an average income worker. I started using Acorns a couple of months ago not only for fun but also for one more element of saving. Now that my family and I are debt – free, we actually use credit cards for rewards and pay them off each month. Tying 2 cards into Acorns seemed like an add-on to maxing out retirement plans and other savings we do monthly. I agree it should not take the place of regular savings. I also agree that focusing on life experiences rather than big expenditures “pays” much better in the long run. We’ve reviewed Acorns on our site. I don’t get why it’s so popular, and it’s one of the most popular articles on our site. Yet check out their AUM. They currently have $25M. They have a LONG way to go before they will ever become a profitable company as well. I think one of the reasons why these micro-savings services are popular is because of the FEDs ZIRP and Millennials desperate to save. I use the Acorns App, but only after first maximizing my 401k contribution, backdoor ROTH IRA, and Health Savings Account. In addition to the “round up” feature, it does allow you to make contributions (in $5 increments). It is this feature that I use the most to apply some behavioral finance to myself (rewarding myself for making decisions that save money). Pack my lunch instead of eating out – add $5 that day. People in the office are collecting money for the lottery pool, pull out smartphone and add $10 instead of buying tickets. Sure, this could also be done with the Vanguard App (a few more steps), since once you have the fund minimum invested you can add any increment. Some folks don’t have the $1,000 to $3,000 to seed a taxable Vanguard account, so this app makes sense for them. For those who already have a taxable Vanguard account, maybe we just need a quicker 3rd party app to allow us to add our funds to Vanguard as a reward for making smart decisions. On the effort vs. result tack: It used to be that a “high interest” checking account was worth the bother of worrying about transaction counts when the rate was higher than you could get on a CD. I had two (with a balance of $70k) for which I needed 22 transactions per month. Then the interest rate on one started slipping steadily downward. It’s now at 1.26% on $50k, and they just upped the transactions from 10 to 12, and stated that if they perceive a lot of small transactions just to make the cut, they will move me to a different account type! Time to close the account, put the money in a 5-year 2.25% APY CD with a 6-month early-withdrawal penalty (Synchrony or Capital One), and stop worrying about transactions. Oh, and my little splurge is that I refuse to skimp on beer. Interesting article. I wholeheartedly support spending a little extra to make your self happy, but I’m an advocate for not spending money on unnecessary costs that will quickly add up, like $4 daily starbucks. I guess we just have to find our own balance! That being said I agree on the saving on the big stuff philosophy, I’d rather drive a sensible car I can afford, that works perfectly fine and be able to choose the craft beer over bud light at the grocery store. Thanks for posting!